The Attorney, starring SONG Kang-ho of Snowpiercer and The Face Reader, is counting down the days to become the first movie of 2014 to exceed ten million viewers. 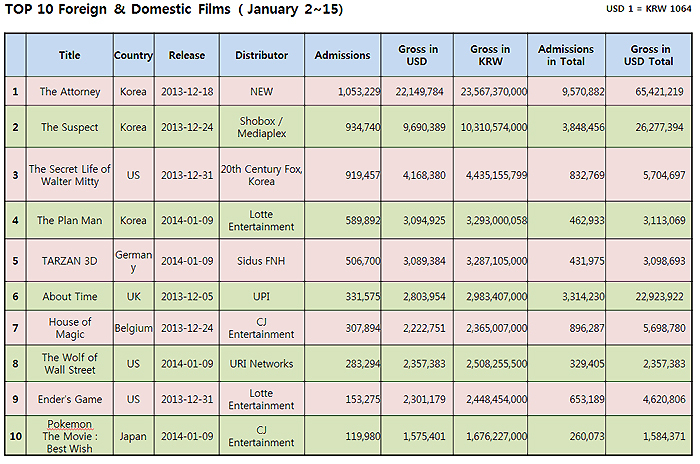 According to the Korean Film Council (KOFIC, Chairman: KIM Eui-suk), the film overpowered its competitors on screens and maintained its position at the top of the box office. A month has passed since its premiere on the 18th of December but a huge number of people are still going to the cinemas to watch what has become an event picture; last weekend, 799,229 tickets were sold throughout the country. On Sunday the 12th, the market share of The Attorney reached 31.9%, more than doubling the runner-up, TARZAN 3D - the animation from Germany that accounted for 14.7% of Korea’s ticket sales. Total admissions for The Attorney up until the 15th have reached 9,570,882. In addition to retaining first place every single day of the last four weeks that it has been on the big screen, it broke the nine million viewer record in just 25 days, one week faster than Avatar (2009), and secured its place in the top 10 Korean films of all time, unseating The Face Reader (9.13 million admissions). Although there were some unfortunate events, such as an illegal recording of the film with a camcorder, The Attorney is expected to top the ten million milestone without any difficulties on the weekend of the 18th and 19th. Now, the question in the industry is whether the courtroom drama will overthrow James Cameron’s Avatar (13.31 million admissions nationwide) and take first place in the Korean box office record book. The result seems optimistic as some big films that could curb The Attorney’s sole lead, such Hot Young Bloods, The Huntresses, When A Man Loves A Woman, and Miss Granny, are all coming out just before the Lunar New Year’s holidays later this month. The Suspect is also on the rise. 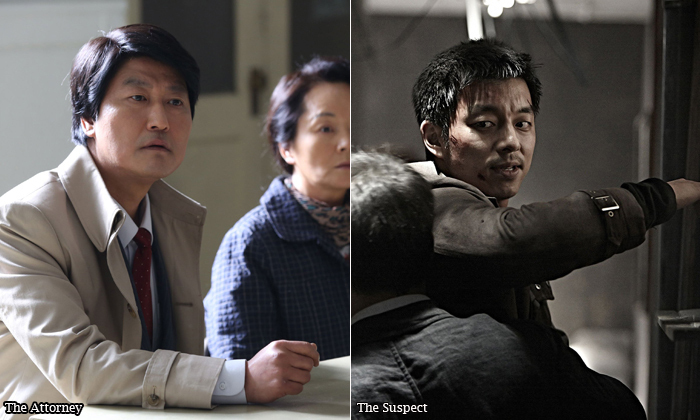 The fourth feature by WON Shin-yun, following A Bloody Aria (2006) and 7 Days (2007), the spy thriller has attracted 3.84 million viewers up to the 15th. When its number of ticket sales reached 3.5 million, The Suspect broke-even and recouped all of its investment, pegged at around KRW 9.5 billion, including KRW 7.2 billion for filming and the remainder for P&A. On the other hand, The Plan Man, starring JUNG Jae-young (of Our Sunhi and AM 11:00) didn’t quite get off on the right foot. Premiering on the 9th, it is SUNG Si-hup’s first full-length film: a director who won the International Mobile Film Competition Audience Award at the Seoul International Extreme-Short Image & Film Festival for the three-minute short film Happy International Student. Produced and distributed by Lotte Entertainment, the romantic comedy was screened at more than 400 theatres but only managed to attract a little under 300,000 admissons during its first weekend. Running long distance doesn’t seem feasible for this film, which has recorded only 462,933 viewers up until the 15th. Among foreign films, family-targeted animation fare has been most impressive. This time, the German’ produced TARZAN 3D, featuring the classic character, attracted 431,975 Korean fans. 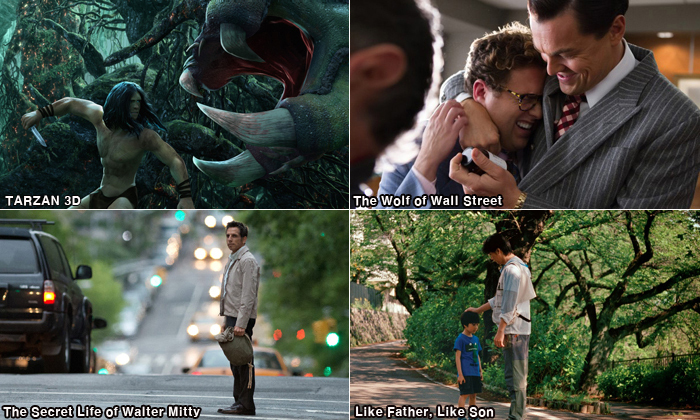 The Wolf of Wall Street, the fifth partnership between director Martin Scorsese and actor Leonardo DiCaprio, attracted 329,405 moviegoers; while The Secret Life of Walter Mitty, directed by and starring Ben Stiller recorded a total of 832,769 ticket sales through to the 15th. Meanwhile, the greatest sleeper hit of the season, About Time, capped 3.31 million admissions and is preparing to withdraw from screens. In diversity film box office, a Japanese production, Like Father, Like Son, stands out alone. Directed by KOREEDA Hirokazu of Nobody Knows (2004) and Still Walking (2008), the film garnered 84,000 spectators by last weekend. Lazy Hitchhikers' Tour de Europe, directed by LEE Ho-jae, is still on the rise and has exceeded 24,000 viewers throughout the country.